The pressure for Channel Chiefs to scale their indirect channels, engage their partners and increase revenue has never been greater. 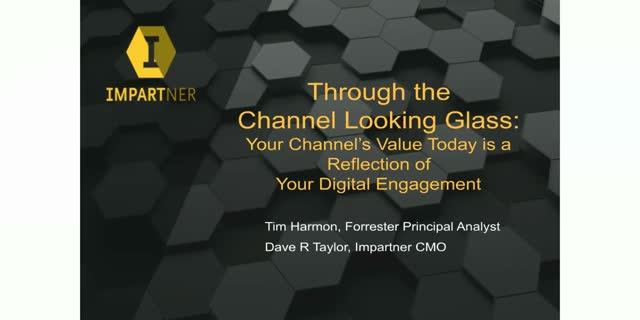 Watch this webinar with Forrester Analyst Tim Harmon and Impartner CMO Dave R Taylor to learn why the digital investments you make in your channel parallel the value your channel delivers. Most important, in this session, Harmon reveals a startling, stop the music stat for Channel Chiefs looking to scale their partner networks: Every dollar invested in a PRM solution saves as much as $10 in reduced manual business costs. In today’s world of bi-modal IT, the battle continues to rage between CMOs wanting to make rapid-fire technology purchasing decisions and IT teams struggling to balance business integrity while at the same time evaluating and implementing new technologies. That battle is never truer than when it comes to Partner Relationship Management (PRM) solutions, which have been proven to as much as double indirect sales, but are often bogged down by organizational alignment issues. This new webinar featuring Global SaaS PRM leader Impartner CMO Dave R Taylor and Gartner Research Director and PRM Analyst Ilona Hansen, outlines the following five key questions sales and marketing pros need to ask up front to streamline PRM purchase decisions with IT. Thinking of home growing your own Partner Portal? Before you do, save yourself months and millions and watch this webinar. Join Impartner CMO Dave R Taylor and Rackspace Global Director of Partner Programs and Strategy Chris Rallo, as he chronicles the company's journey through building its own Partner Portal, using Salesforce's CRM platform to build a PRM solution, and ultimately turning to Impartner's turnkey SaaS PRM solution, which had them up and running in weeks versus months with no disruption to their partner ecosystem. When data protection software provider Asigra wanted to enhance the experience it delivered to its global network of 500 partners, it turned to Impartner's PRM solutions. Find out how Asigra's new Partner Portal helped draw an influx of new partners and increase portal usage to more than 40 percent. When ViaWest was seeking a full-featured PRM system that included automated on-boarding, deal registration, reporting and additional modules to replace the email and manual processes it had been using, they turned to Impartner. Since deploying Impartner, ViaWest has automated nearly all partner support processes, significantly reduced the number of manual hours spent managing its partner program and increased partner applications by 30 percent. By all indications, there is a ground swell of momentum for selling though the channel as companies increasingly turn to indirect sales to ramp their revenue. What then, are the trends that marketers and channel chiefs alike need to navigate to make sure their companies are best positioned to ride the wave and maximize their return on channel investment? In this webinar, join Impartner CMO Dave R Taylor as he crystalizes the company's top 7 predictions on what will drive channel sales this year - and what to do about them. Impartner is the world-leading provider of SaaS-based Partner Relationship Management (PRM) solutions and for nearly 20 years, has helped some of the world's top corporations from National Instruments, to Workfront to SGI bring their channel programs to life. When the top marketing work management SaaS solutions company Workfront needed to expand its growth through the channel, they were looking for a Partner Relationship Management solution that could grow and scale along with the company. Their choice was Impartner, which now powers the company's global Partner Portal. Learn how Impartner’s solution helps them take care of the operational basics of Workfront's channel program, so they can get on with their true business of growing, scaling, and reaching those partnerships. The CRM battlefield has been leveled. If you are one of the 80% of companies who sell through the channel, you are leaving money on the table if you are not using modern, Partner Relationship Management (PRM) solutions. Join Impartner CMO Dave R Taylor to learn more about why PRM is new CRM, and why it’s the single most important ingredient to managing your channel, accelerating your ROCI, and winning competitive battles. Return on Channel Investment (ROCI) is the No. 1 concern of channel chiefs. Join Forrester Principal Analyst Tim Harmon and Impartner Chief Marketing Officer Dave R Taylor to learn more about why you need to manage partners' performance the same as you do your direct sales team, and how you can truly be able to view and optimize your channel investments. Why is PRM the new CRM? For the 80% of companies that sell through indirect channels, it's the secret sauce for accelerating indirect sales. Sign on for a definitive review of Partner Relationship Management: What is it, who is it for, do you need it, what are the pitfalls, how to buy it and how to get started.